The Australasian Investor Relations Association’s mission is to advance the awareness of best practice in investor relations in Australasia and thereby improve the relationship between listed entities and the investment community. A critical event for all New Zealand IR practitioners to hear updates on regulation, captial markets, IR practice and shareholder engeagement. Founded in February 2001 by a broad steering committee of investor relations professionals across major Australian and New Zealand companies, the Australasian Investor Relations Association (AIRA) was established to provide listed entities with a single voice in the public debate on corporate disclosure issues and to improve the skills and professionalism of its members. Corporate MembersREPRESENT over A$1.2 trillion of market capitalisation, over 80% of the total market capitalisation of companies listed on ASX and over 82% of the total market capitalisation of companies listed on the New Zealand Stock Exchange. Michael Hufton Managing Director, ingage (UK) - Conference Sponsor "AIRA's Annual Conference is attended by most large Australasian corporates and is probably the best of all the large IR association conferences anywhere in the world." AIRA's 2018 Annual Conference was held at the Westin Hotel, Sydney on 22 November. We would like to thank our partners, sponsors and delegates for their support of this event. The 2019 Conference and Awards Dinner will be held at the Grand Hyatt, Melbourne on 21 November. Through its voluntary CPD program AIRA aims to lift professional standards across the IR industry in Australasia. It encourages members to undertake a minimum of 20 hours CPD per year. Offered over three days, this specialist course provides critical training for those at the coalface of investor relations. Offered online, AIRA's Certificate of Investor Relations comprises the seven modules that make up Day 1 of the Diploma course. This training can be undertaken at any time by students. AIRA offers students who have achieved their DipIR credentials the opportunity to participate in a four month Mentoring Program. 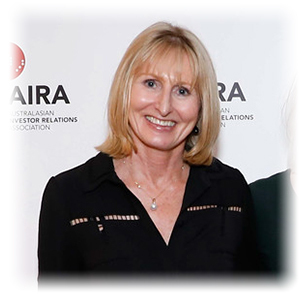 AIRA is delighted to offer AIRARecruit to better connect Investor Relations professionals, employers and professional recruitment firms. The service provides a three unique offerings designed to make recruiting specialist investor relations roles easy. Listed entities and service providers who are looking to recruit specialist investor relations or other related roles. Bi-monthly AIRA circulates to its Members an electronic newsletters that focuses on industry news, contemporary investor relations themes and comings and goings in the market. AIRA's Knowledge Centre provides access to written papers and news pieces on contemporary investor relations themes. Need to understand Best Practice - why not download, AIRA's Best Practice Investor Relations: A Guide for Australasian Listed Entities or the Environmental, Social & Governance Engagement Guidelines. AIRA provides the industry voice for its members on regulatory, legislative and other proposed changes that will influence the practice of investor relations across Australasian listed entities. As part of AIRA's professional development program, it provides to members free of charge a series of webinars that focus on practical topics relevant to industry professionals. Annually AIRA conducts a number of research pieces comprising snap polls, benchmarking studies and remuneration studies to keep members abreast of key trends and changes across the industry. Watch this space, AIRA to release a IR Community Chat function over the coming months.